In the spirit of All Hallow’s Eve, I give you a ghost story. About a decade ago, this tale won a ghost story competition at Trent University and was published in the Peterborough newspaper. 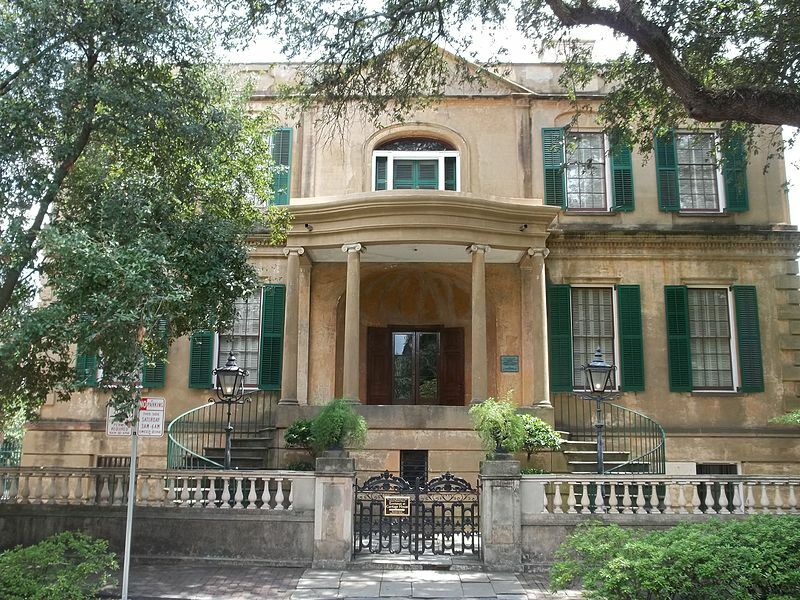 Inspired by a tour of Owens-Thomas House, an antebellum mansion in Savannah, Georgia, the story refers to “Haint Blue” which is a blue colour, said to keep out ghosts (or haunts – haints). The Owens-Thomas House is a stunning home. But it was the slave quarters discovered in the old carriage house during restoration work that fascinated me. The drywall was removed and revealed walls painted in “Haint Blue” that nearly 200 years later, was still there and visible on parts of the rough walls. Our tour guide told us that that particular colour of blue was painted on the wall and around windows and doorways to keep evil spirits out. And I wondered what else besides that paint still clung to that house and its history. And so it inspired my story. I told ‘em. I told ‘em what they needed was a good coat of haint blue – at least on Miss Clarissa’s front door. Would they listen – not on your life, no sir, not to old Florrie. Superstition and foolishness, they said, dismissin’ me as if I were some kind of harbinger. I like that – harbinger. Deputy Sheriff Sierra said that to me standin’ next to Miss Clarissa’s bench in the Square. Yessir, he lookit me with those bright eyes of his, and he smiled and said in front of half the town: Why Florrie, are you some kind of harbinger for the spirits? And I lookit him right back and I say, no sir, I aint no harbinger, I’m just tellin’ you all I know on this subject, and I know you better get yourselves a nice can of haint blue and at the least you paint that door , sir, you paint that door today. Then I turned on my heel, and cross the street straight over to Miss Clarissa’s house. And I used the front door without so much as a ‘scuse me, and I closed it tight behind. And then I went down the hall to the library and found her daddy’s dictionary – the one as big as a piece of fine furniture – and I lookit for that word, harbinger, and when I found it, I rolled it ’round on my tongue for some time and I decided that I liked being a harbinger, a person heralding the future – like the heraldin’ angels, I suppose. And I’d rather think about angels and Heaven and all, but I’m lookin’ over at that door and listenin’ to Miss Clarissa’s granddaddy’s clock marking a quarter of the hour. And I know it’ll be just a matter of time. So, I went downstairs to my room and pulled out my valise and my Mama’s carpet bag and I started into packin’ and didn’t stop until I had all I could fit inside my bags. I didn’t stop when the telephone rang, and I didn’t stop when the doorbell rang, and I didn’t stop when the knockin’ started on the door. I didn’t stop until I had each one of them bags set in the front hall, and even then I didn’t open that door right away, though I could see through the dining room window that there was at least thirty of this town’s finest citizens standin’ on Miss Clarissa’s front steps and on the walkway leading up from the street. I slipped back into the parlour and made sure that all the flowers was just the way Miss Clarissa would expect, and that there weren’t a speck of dust on the mantel ’cause I know Tory Lennox would run her gloves to be sure. Then I checked that not one bit of lace was out of place at Miss Clarissa’s throat for surely her cousin Hattie would fuss all over the lace and then I went right for that door and opened it and one after the other, they all trooped in – not a one of ’em lookin’ at me other than Deputy Sheriff Sierra with them eyes and he says, real low and with a kind of hissy noise, Old Missy Harbinger, I see, but I keep my eyes down, even after he swings in behind me and kicks at my bags. And I want to say to him, Deputy Sheriff Sierra, my Mama told me, and her Mama before her, and her Mama before her, and all the way back to before we was hauled on over here: A restless spirit can’t never cross over haint blue. But he wouldn’t listen, and I know that just as sure as I know they can bury Miss Clarissa six times six feet down, and it won’t make no difference. So I stood at the door and I keep my eyes down. I know I might have looked up to the top of the stairs, and I know I might have seen Miss Clarissa’s Daddy and Granddaddy standing there like I’d seen time and time again – even after they had no earthly business bein’ seen. But I kept my eyes down – I didn’t want to see them no more. And then I left. Far as I know, nobody was puttin’ no haint blue on Miss Clarissa’s front door. And sweet Jesus I know – I just know – she’s gonna to stick to that town like slugs on a stone and I am most surely glad to be waitin’ on a bus. And it don’t matter a slice to me where that bus is headin’ – just so I’m somewheres else, come sundown.